Iron Mountain looking east from Highway 67. 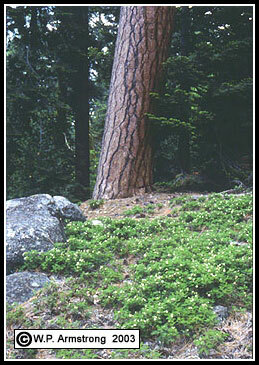 The mountain was blackened by the enormous Cedar Fire of October 2003. The mountain core is composed of batholithic, granodioritic rock. Some of the boulders are reddish from iron deposits and possibly from the formerly-overlying red Bedford Canyon formation. 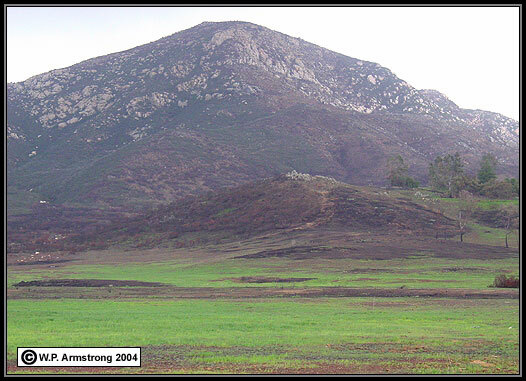 Soils on the mountain include decomposed granodiorite and iron rich soils derived from iron deposits in the fractures and perhaps remnants of the Bedford Canyon Formation. 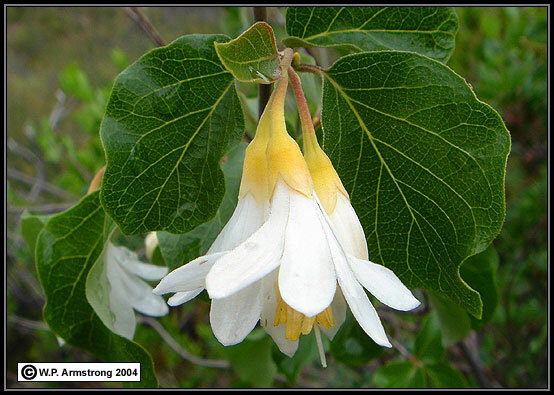 Curiously enough, Iron Mountain contains some of the same endemic plants that are found on gabbro soils. 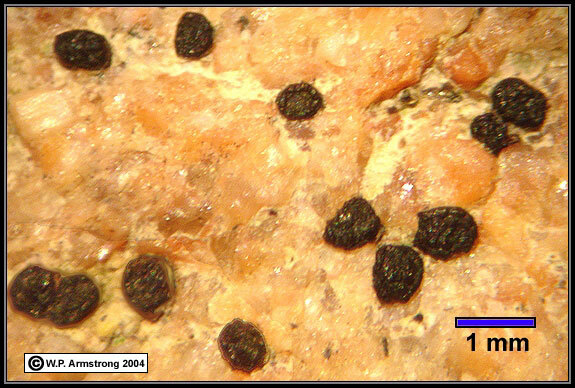 Gabbro Endemics In The San Marcos Mts. 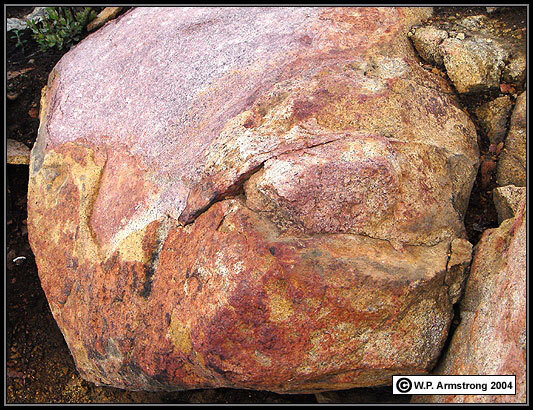 The colorful reddish boulders on Iron Mountain have contributed to reddish iron-rich soils, and possibly to the unique flora. Magnified view (40x) of reddish rock on Iron Mountain. The minute, black, cup-like structures are lecideine apothecia from an endolithic lichen (possibly a species of Lecidea). [Note: These are not melanomas on human skin.] The thallus of this lichen embedded in cracks and crevices of the rock. In lecideine apothecia, the rim of the ascocarp does not contain photobiont algal cells. It is generally the same color as the hymenial layer of the cup (in this case black). In lecanorine apothecia (see next photo), the rim contains algal cells and is generally the same color as the lichen thallus. Cup-shaped lecanorine apothecia of Xanthoparmelia cumberlandia, a common foliose rock lichen throughout San Diego County. The apothecium is lined with microscopic saclike structures called asci, each bearing eight ascospores. This reproductive structure is produced by the fungal symbiont (mycobiont) of the lichen. 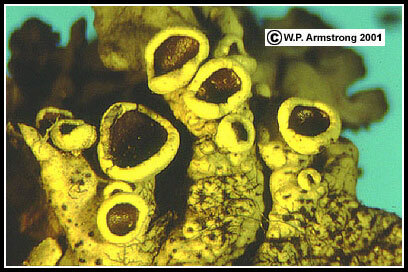 Nonlichenized fungi (without the algal symbiont) in the class Ascomycetes also produce cup-shaped apothecia. Because of their distinct apothecia, members of the class Ascomycetes are often referred to as cup fungi. 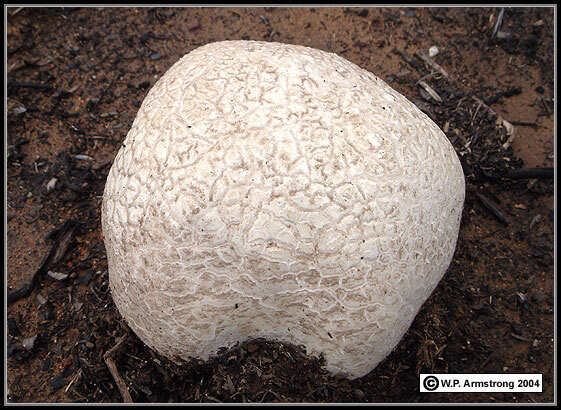 A baseball-sized puffball (Calvatea gigantea) in a grassy meadow at the base of Iron Mountain. 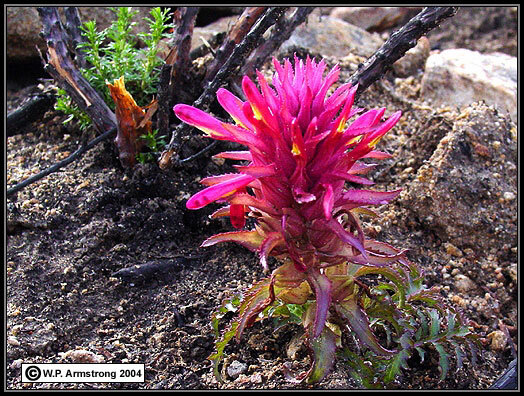 Indian warrior (Pedicularis densiflora) sprouting in the ashes four months following the Cedar Fire of October 2003. The chaparral slopes of Iron Mountain were blackened by this raging fire. Snowdrop bush (Styrax officinalis var. redivivus), an member of the storax family (Styracaceae). This unusual shrub or small tree is uncommon in San Diego County. 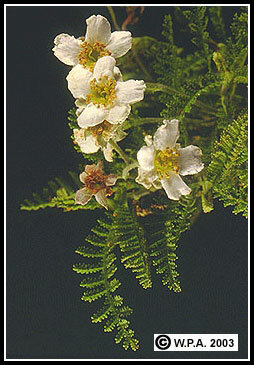 Left: Chamaebatia australis, an endemic shrub in the rose family that grows on Iron Mountain. This species occurs on several isolated mountains in San Diego County, including Tecate Peak, Otay Mountain and the San Marcos Mountains. The foliage is very resinous with the aroma of witch hazel oil. The flowers superficially resemble strawberries or black berries. Right: Another species of Chamaebatia (C. foliolosa) forms a dominant, low-growing shrub on the western slopes of the Sierra Nevada. It is called mountain misery, perhaps because of the strong-smelling resin that gets on your clothing as you hike through thickets of this shrub. The conifer in the distance is a ponderosa pine (Pinus ponderosa).